It has been widely reported that a leap second was added to clocks at midnight to prevent the time from drifting with respect to the Earth’s rotation. Big Ben, or more precisely the Great Clock at the Palace of Westminster, had to be adjusted in advance of the night, to ensure Big Ben chimed at the correct moment to ring in the New Year. In order to measure this change for myself, I set my watch to the time signal on BBC Radio 4 on Tuesday. 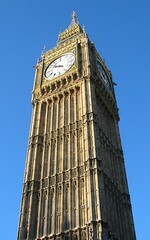 Yesterday, they broadcast Big Ben’s chimes at 6pm on the same station, as they always do. Sure enough, the chime came a second late. The leap second had already been added! At midnight, the famous clock was broadcast on TV, and once again was a second behind my watch, although it was now my watch that was a second fast. Unfortunately, little experiments such as this may not be possible in the future without visiting London. I was using analogue radio and television. The government plans to have switched off all analogue TV by 2012, and there are now plans afoot to do the same to FM radio in in the next decade or two. Unlike analogue broadcasts, which arrive almost instantaneously, processing and the way digital signals may “bounce around” before being decompressed at the receiver means that the received broadcast will lag behind its transmission. This is the reason the BBC dropped their famous clock idents from BBC1 television some years ago. Internet broadcasting lags even further behind, routinely by half a minute or more. This delay in transmission will mean that anyone who relies on the televised Big Ben to mark the start of the New Year is likely to be celebrating slightly late. While some may say this doesn’t matter, what is the point of watching Big Ben at all, if it is not to hear the exact moment the New Year begins throughout the country? Why not record the programme and celebrate the New Year another night? Instead, for the accurate time, it will be necessary to use a clock set by the Radio Time Signal, or the clock on a computer set by Network Time Protocol. So the only way to hear Big Ben to ring in the New Year will be to go to London. But even then, how accurate is it? Unless you’re standing right next to the tower, the sound of the bell will take a time to reach you. In fact, anyone who is a certain distance from Westminster, and who simultaneously listens to an analogue radio broadcast, can hear 13 chimes at midnight. Being just a kilometre from the tower means a delay of three seconds, and even standing at the base, there is almost a third of a second delay before you hear the chime! Analogue broadcasts have provided the only way of hearing the chimes at the time they sounded. In future, anyone who isn’t lucky enough to have access to the clock tower at the Palace of Westminster will have to make do with the their radio controlled watch or computer to ring in the New Year – and that just doesn’t seem quite the same! I remember that my physics teacher in the 60s used to tell us, as an illustration of the relative speed of sound and light, that we, in Yorkshire, were hearing the chimes of Big Ben before the average cockney. And to continue. Does it matter? I was sound asleep at midnight last night. I don’t think you are quite correct in the second bit of this statement, Jonathan. The radio industry in the UK would like to ditch AM (Medium Wave and Long Wave), but the future for FM is a bit more rosey as an analogue broadcast medium as its uses are still recognised. It may not always be used by the national broadcasters, but there is likely to be an analogue service on there for some time to come. However, whatever method of distribution the broadcasters transmit their signal to the listener by is to some extent irrelevant, even for time-keeping. It’s the links between the source of the sound- in this case “Big Ben” and the studio control rooms and then onward to the transmitter that determine as much as anything when we perceive a live event as taking place if we are not actually there in person. The BBC has for many decades had a microphone in place atop the clock tower to broadcast ‘Ben’ at 18.00 and midnight GMT/BST, and for many years the quarters were also broadcast on the BBC World Service until, sadly, they decided to ditch the sounds of the most famous clock bell in the world. In theory therefore, that microphone is about as close as you can actually get to the sound of the Westminster Chimes without actually being there. But the output of the mic has to go through to the continuity studio at Broadcasting House, and then be distributed onward to the various transmitters- which the BBC no longer even own. While many of these links still use good old wires or even better fibre optics- meaning the signal goes literally at the speed of light- others use digital encoding (ISDN) to even get to the transmitter, meaning that there must inevitably be some kind of delay, however miniscule, between the actual chiming of Big Ben and hearing it on-air. The upshot of all this is that already, though sadly, you have to take time-keeping from even so-called “terrestrial” broadcasters with a pinch of salt these days. The worse case scenario with any broadcast is that it could have been uplinked to a satellite then back down to earth again- causing a delay in itself- before further displacing ‘real time’ by the digital processing involved in getting it to your radio or television receiver. As Jonathan rightly asserts, the only really accurate- and patriotic- way to celebrate the turn of the year is to rely not on 150-year old Ben, but the real national time-keeper, the 21st century caesium atomic clock at the National Physical Laboratory in another part of London- not Greenwich, but Teddington. My brother works there, and assures me that the “time lords” were hard at work around midnight ensuring the leap second did indeed make its appearance at the correct time There’s no point rushing to NPL itself each New Year’s Eve though- this highly scientific piece of kit is not something the public can look up at and listen to each 31st December! However, you can hear a reference time signal on short wave radio, transmitted by the Teddington clock to the national transmitter, which used to be in Rugby but moved to Anthorn in Cumbria a few years back. How BT distribute “the Time from NPL” (the actual words used on the hourly time check) the 300-odd miles from Middlesex to North-West England I do not know, but my brother tells me the difference is likely to be nano-seconds. Perhaps we shouldn’t worry too much about these little technicalities, but content ourselves that Britain remains a world-leader in precision time-keeping. Britannia rules the clock! Surely once the national broadcasters abandon FM, it wouldn’t be viable for small, local stations to keep it going? Add to that the government’s eagerness to gain a windfall from selling off the frequencies to mobile phone companies, and it doesn’t look good for FM.